The rain mostly stopped around 12:30am last night. The rest was just sprinkles or blown drops coming off the trees. I was hopeful that the rain would reduce the humidity like it has in the past. The pattern so far has been that it cools significantly after rain and then it takes a few days to build up with humidity increasing each day until it rains and repeats the cycle again. Unfortunately, that isn’t the case this week. Apparently, there is a 50% chance for rain or thunderstorms all week. Today it stayed dry and partly cloudy, which was great, but due to the humidity, it felt like I was in greenhouse all day. I’ve been waking up with the alarm clock of the birds each morning, which is getting earlier and earlier. Today, I was awake at 5:30am, so I did some emailing before packing up and was hiking by 6:45am. It was a foggy morning, but lifted after an hour. I had a tough morning as I just couldn’t get my mind or my body to wake up. I felt like I was dragging and I think it was the humidity. It was only about 80 degrees, but the humidity made it difficult. The hiking was some of the easiest all trail, so at least I had that in my favor. As an example of how rocky trail can slow the pace, I hiked an hour less than I did yesterday and relaxingly did more miles. There was only one view today off a side trail with a small scramble up Chimney Rocks. 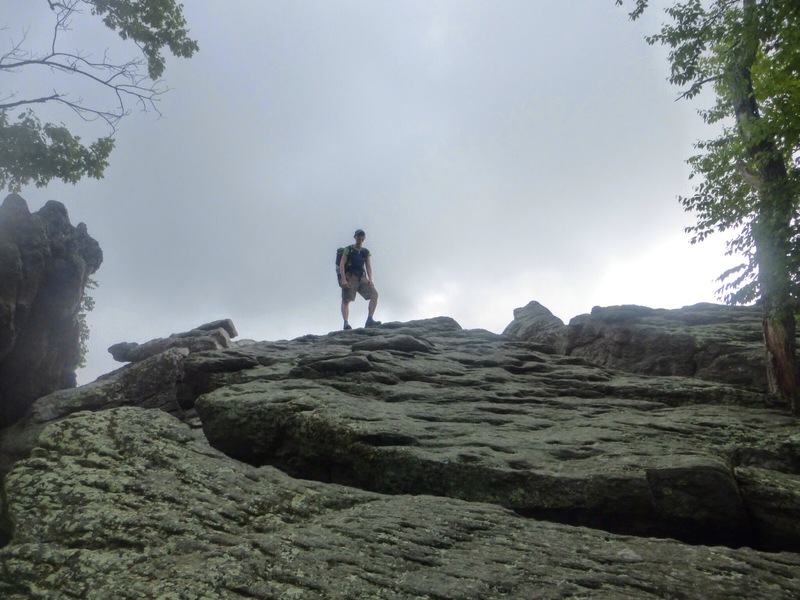 Some section hikers were at the bottom and were able to get a picture of me on the rocks as the fog was lifting. 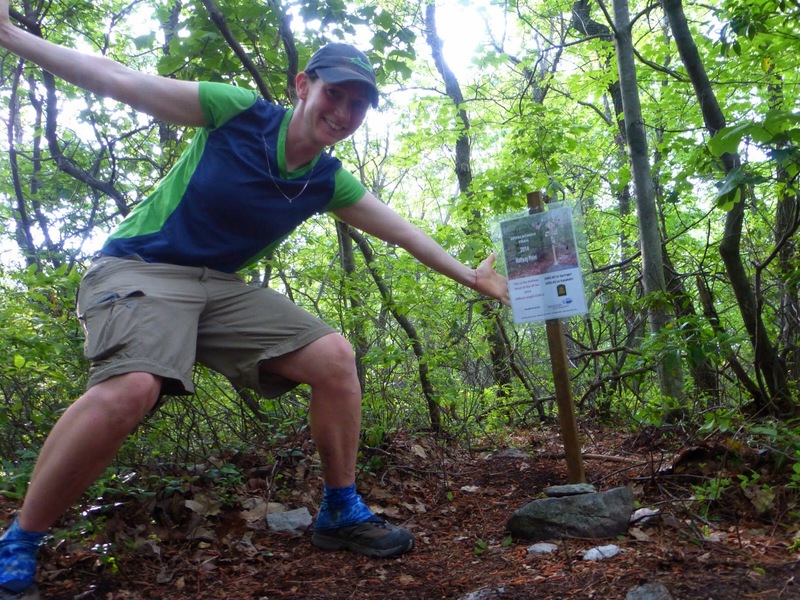 I only saw one thru hiker as I hiked today. It was Iron Chef who I’ve been around for the last month and seen a few times. He is slack packing (hiking without a pack) this week while his dad does the shuttling. Iron Chef overlapped with me for a bit before lunch and his dad was waiting at the road with IC’s lunch, so we ate together. Thankfully the sun was out to dry my tent which was just damp and my shoes and socks which were also damp. 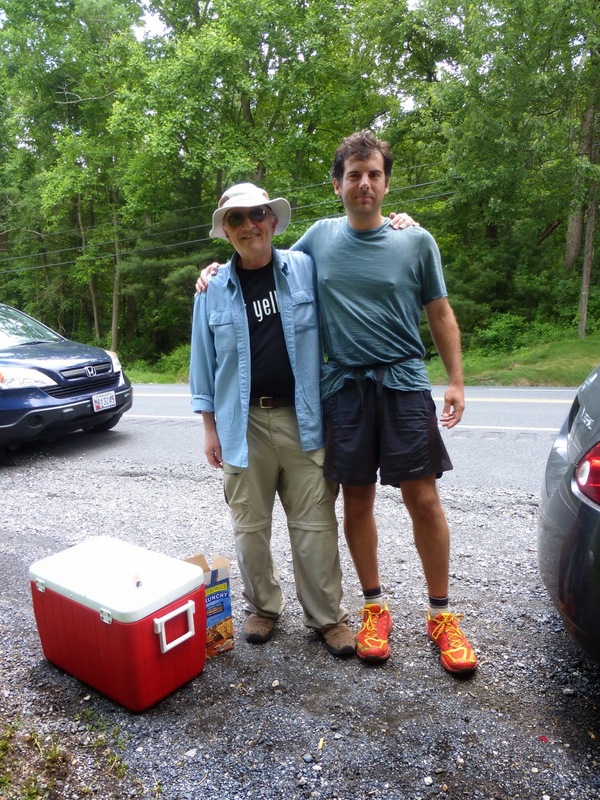 IC’s dad had a cooler for other hikers and it was heavenly to get ice cold water to mix my Crystal Light in for lunch! IC hiked on quickly with a shorter lunch and I may see him tomorrow when he returns to the trail. Other than that, I saw a few section hikers, but hiked on my own the rest of the day. Iron Chef said the best description he’s heard of this lack of other hikers is that we are at the eye of the storm. There is a lot of movement all around us, but still and calm where we are. It goes through ebbs and flows and I’m sure I’ll soon be coming in and out of others like I did at the beginning of the hike. The summer is coming and there are more sectioners out. 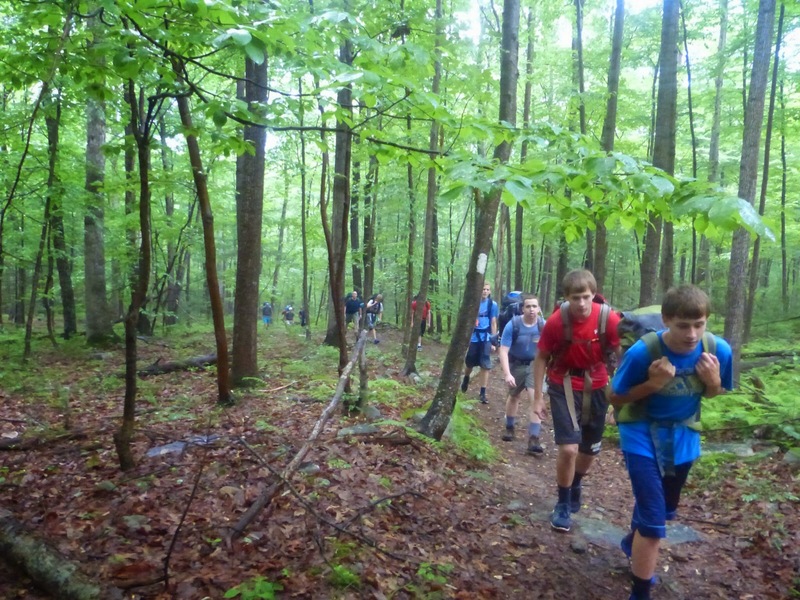 The last few days I’ve seen many Boy Scout groups and that’s always funny to see a train of tired boys marching by. I finished the audiobook of the Alchemist which Robin Hood and All In just read. I like it. It can be a bit much at times, but it gets people thinking about their life’s journey. The whole theme of each person being in search of their own legend and the important impact people have on one another. There really wasn’t much today other than the one viewpoint. Lots of uneventful wooded hiking. Great for cruising! I somewhat got more energized in the afternoon when more clouds came in and it cooled slightly, but the humidity remained stagnant in the thick air. I know worse is coming as summer heat and sun hasn’t even hit yet. I can say that I definitely don’t smell great and I’m glad I carry the full stick of body glide for this hike! The main motivator of the day was to make it to the halfway point at the end of the day. 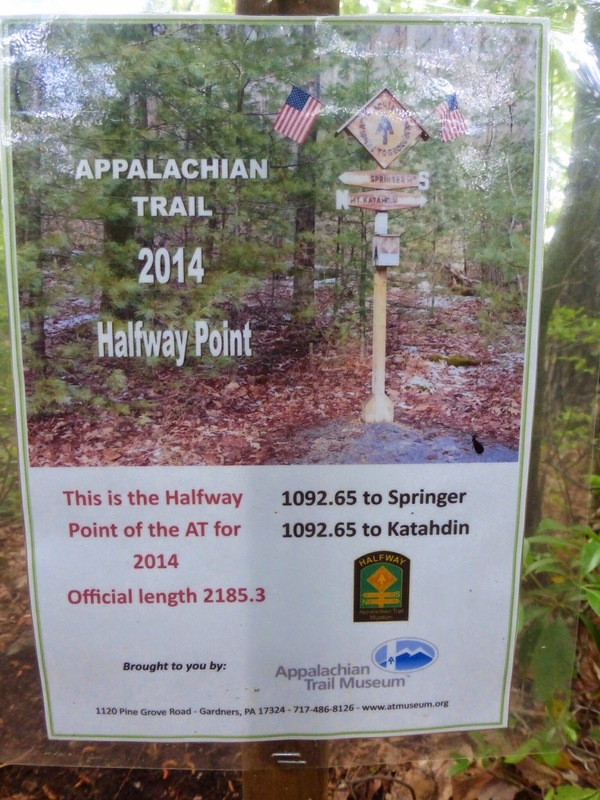 It moves slightly each year with slight changes to the trail, so it is noted on a small laminated sign that is on a post next to the trail. I set the camera on my pack to get a selfie. I’m happy to say that even with my three zeros, my daily average is just above my 20mi/day average that I like. Somehow both the PCT & CDT averaged out to 20-21mi/day so it’s fun to see that it is consistent here too. Just over a mile after the midpoint is a campsite, but I chose to stop early for two reasons. One is that I know I’ll naturally wake up early and about 6mi from me is the AT Museum which will open at 9am which will work out perfectly for my regular schedule. Also, next door to it is a general store that sells half gallons of ice cream for the half gallon challenge, which I will not be doing. I couldn’t even eat a pint if I tried. However, I did see a group of hikers at the last shelter who ended up walking past my camp spot tonight to get to that campsite and also go to the museum tomorrow morning. 9 thru walked by and I only knew two of them. I guess being the eye of the storm is short lived. I may see them all tomorrow. I’m pretty proud of my camp spot tonight. 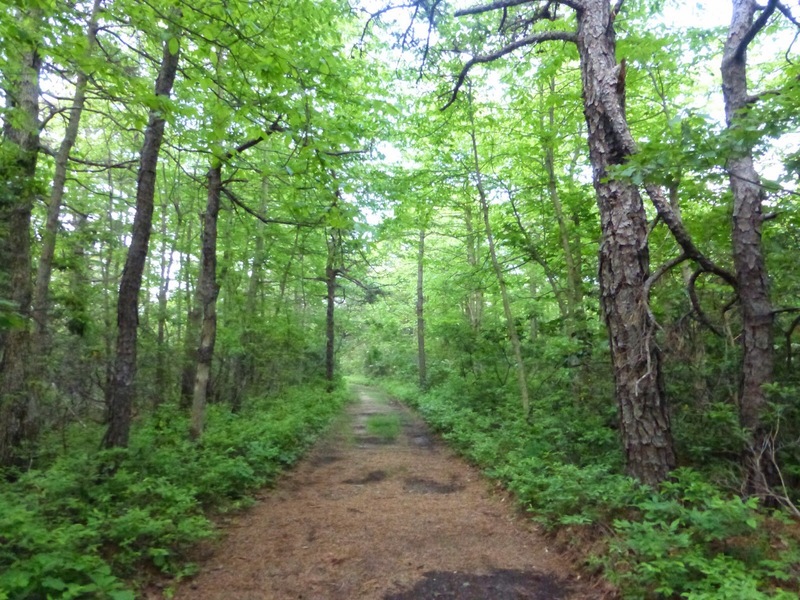 There was a ton of brush on both sides of the trail as it was filled with rows and rows of mountain laurels. Not all have bloomed, but I’ve heard it looks really cool. 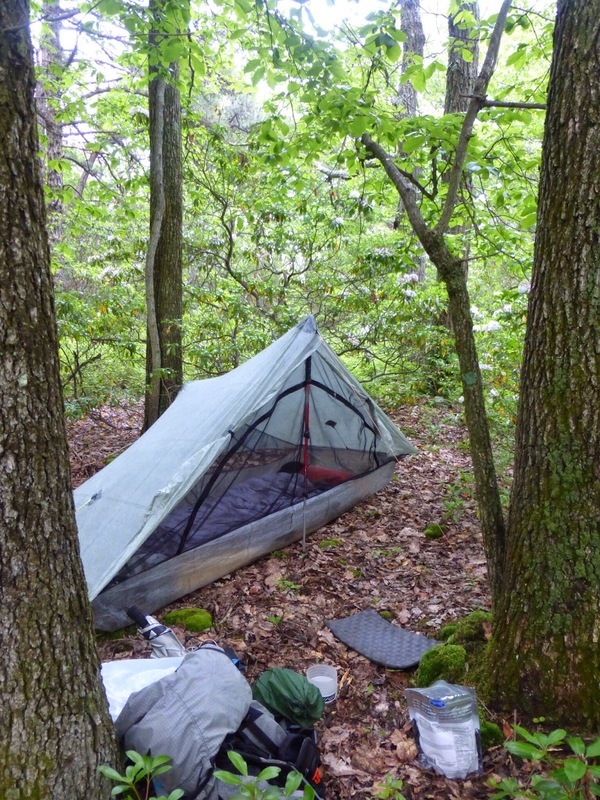 I found a flat spot to squeeze in among the mountain laurel for the night and I was happy to have space to myself so I could do my chores and blogging quickly. I’m nodding off as I write this and it’s only 9:10pm, which is past hiker midnight, but still a good 30mins earlier than many nights for me. It has cooled off well and I’m going to sleep great!